In order to meet our partner’s expectations Addit acting according to Industry 4.0 implements Smart Factory Project in relation to our production. Time of big production lots for sheet metal processing and contract manufacturing companies has gone. Today’s market expectation is short lead time and frequent deliveries as well as small lots in the shortest possible time. We can add to that short term changes in projects and quite often no time for manufacturing sample products. All of these should be achieved without extra program costs, special tooling or high cost of machines set up. This change cannot be performed thanks to faster machines. It requires rethinking of production management method including whole delivery chain. That is why Addit in order to meet our partner’s expectations or even exceed them in some areas is acting according to Industry 4.0 implements Smart Factory Project in relation to our production. Current approach oriented to maximal utilization of resources fitting to big and mid size production lots will be replaced at Addit by managing of small and rapidly changing batches oriented to quick reaction and short time of a process. Addit has extensive experience in High Mix, Low Volume production. However what we have already achieved has met organizational challenges due to large diversification of production. Setting up the machines is a significant cost, the more visible, if we are to produce one, two or a few pieces maximum. If we would have wanted to produce such small lots in a standard way we would need to double our machine park, which obviously is related with increase of need for production area and employees. Assuming we would be able to provide these resources the product itself would be so uncompetitive that nobody would like to pay for it. That is why the best solutions is to create a mass production from such diverse low quantity products. Special tooling has similar importance in low quantities costs as set up time. Programming process must base on digital 3D model. Special tooling for bending process needs to be replaced by adjusting construction of a part to optimal production. Small lot – a system assuring production of an exact quantity, which is required by customers, always at the same price regardless the amount of the parts. Preparation phase will base on digital 3D model of the product. First step is dividing the main part into particular semi-parts and other elements. For this task we will use a Cadman software delivered by LVD. Decisive incentive to use it is a fact of possibility of integration of this software with bending machines from LVD Addit uses. Programing these machines starts creation of production process. 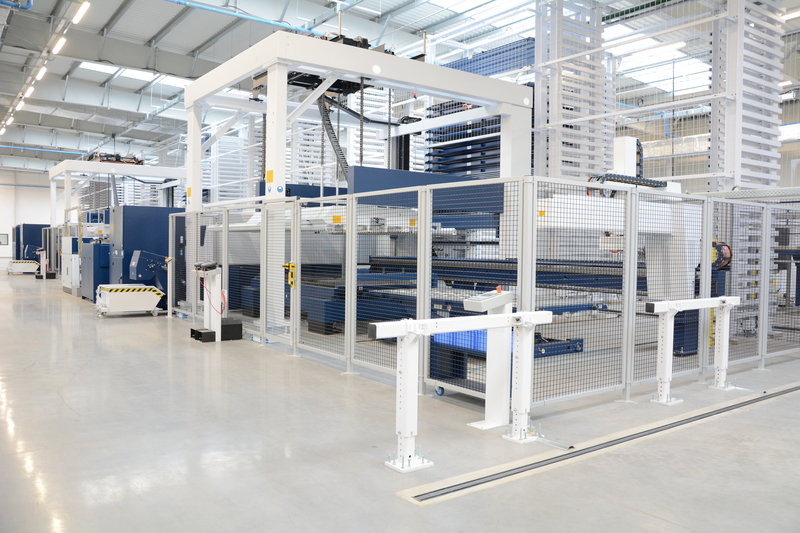 When it comes to cutting process TruTops Boost from Trumpf is a tool to be used to program the machines. Having good quality 3D model without necessity of applying drawing’s correction will enable us program the machines, which is equal to production preparation in not more then a few minutes. In this way we make ourselves more flexible for a needs of product’s changing due to their short life cycle. Cutting process we will be based on Trumpf machines and automatic Stopa warehouse. Whole system is automated starting from sheet metals storage ending with release semi-products for further processing. Another important element of manufacturing cycle is logistic service for products consisting of over a dozen or even more parts. A special system trolley designed for this need will be used to provide highest standard in this regard. All semi-finished products will be transported on it for next processing. This task is crucial in order to secure that all semi-finished products we arrive at the same time to each from the next production processes. Mentioned logistic solution will give us such guarantee. Production cells consisted of spot welding, welding, polishing as well as other accompanying processes will be organized so that products could be manufactured in a short period of time by all employees in the cell according to One Piece Flow rule. Next important step in the production management process will be using PLC controllers for automatic data collection on each machine and production stand. We will be able to automatically register cycle time of each and particular machine used for a given process. This will also give a possibility of monitoring product’s realization status. So complex, innovative and covering wide spectrum, when it comes to production management Smart Factory project realized at Addit will enable our customers increase their flexibility and competitiveness on the market. And we will continue to focus on constant improvement for a needs of our business partners, employees and owners.